If you have recently wondered if allergies and asthma are on the rise then you are correct. According to the American Academy of Allergy Asthma and Immunology the rates of those affected are definitely increasing year over year. While there are many factors contributing to this, one thing that has a negative impact is a buildup of microscopic allergens inside the home. Dust mites, pet dander, pollen, and even human skin cells are just a few that can find themselves hidden deep down in the fibers of your carpet. As you can imagine, removing them from your home is a good first step towards having a healthy indoor environment and fortunately for you there are many quality vacuum cleaners that can do the job. Dyson is a brand known for ingenuity and suction power but they are also one of the best brands for removing allergens. They have been conducting research specifically about allergies for the last 15 years. Believe it or not Dyson even has their own dust mite farm where they study them at length with the goal of building vacuums to effectively (and completely) remove them from your home. As a result their full lineup of upright, canister, and lightweight cleaners are certified to be Asthma and Allergy Friendly. 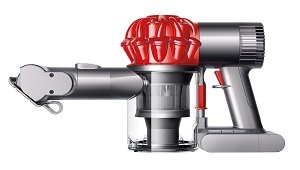 Dyson vacuums come with their well known cyclone technology which uses a unique design to the air pathway. As the air is pulled into these cyclones the amount of centrifugal force is so powerful that the dust is separated from the air. The smallest particles cannot escape as they are literally thrown right out of the air to eventually be captured in either the HEPA filter or dirt collection bin. The clean air can then pass back into your home so the next time your breathe in you won’t have any allergens to cause a reaction. And not only will the air be filtered but the vacuum will have almost no chance at clogging. Most bagless vacuum cleaners suffer from occasional clogging which can put a serious damper on performance, but not a Dyson. Their machines push the air with such force that there is almost no chance of dust buildup along the way. The larger upright and canister models have their differences but when it comes to allergy relief they do share several key features. It’s no surprise that dust particles can escape from the cracks and crevices of cheaper vacuum cleaners as they are not fully sealed inside. Dyson models don’t have this problem as their components seal up tightly together and their filtration is among the best and removing microscopic particles. Virtually nothing can escape during use. Many bagless vacuums also suffer from dirt escaping when the bin is emptied into the garbage. Dyson has a hygienic solution to this problem with their push of a button design. Simply hold the removable collection bin over the garbage and push a button. All of the debris is emptied without the need to touch any of the dust. Full sized lineup with strong suction, sealed HEPA filters, and enough attachments for all surfaces around your home. Click here for current prices and availability at our recommended online supplier. Multi floor cleaning ability, they remove allergens from hard surfaces as well as carpets. Bagless design with push button empty design. Click here for additional information including online consumer reviews and pricing. A broom or mop used to be the tool of choice for hard floors like tile, linoleum, and hardwood but that is no longer the case. Sweeping your floors agitates a lot of the particles so the end up in the air, and ultimately settling on the items in your home. And mops aren’t much better as they tend to push the wet dust particles around causing them to collect on corners and between cracks. 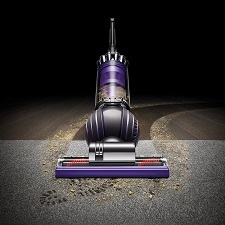 The Dyson V6 and V8 cord-free vacuums do a much better job on all surfaces as they have the extreme suction that Dysons are known for with a variety of attachments and configurations to handle all surfaces. You can operate them in handheld mode and then attach the extension tube for floor cleaning. Plus, their unique lithium ion batteries will charge fast and last longer than you would expect (sometimes up to 40 minutes). The suction is constant with no fading as the battery becomes drained. This is a problem that plagued prior generations of cordless cleaners but is not something the V series suffers from. Clean your mattress, furniture, curtains, and all floor types so you can have a healthy and allergen free indoor environment. Powered by specially designed lithium ion batteries that last much longer than the competition, with fade free suction. Multiple configurations for a variety of jobs. Click here to compare pricing and read more about them at our recommended internet supplier. According to the Asthma and Allergy Foundation of America, Dyson has the largest selection of certified vacuum cleaners of any of the major brands. They come with 2 or 5 year warranties and are engineered to last for more than 10 years. For the last 15 years they have been specifically targeting indoor allergies and improving the technology to remove them. Take a look at their current lineup to see how their technological advancements have really set the bar higher in the industry.